This is one of my favourite recipes and I bug chef to make it for me a lot.. which drives him up the wall I’m sure! 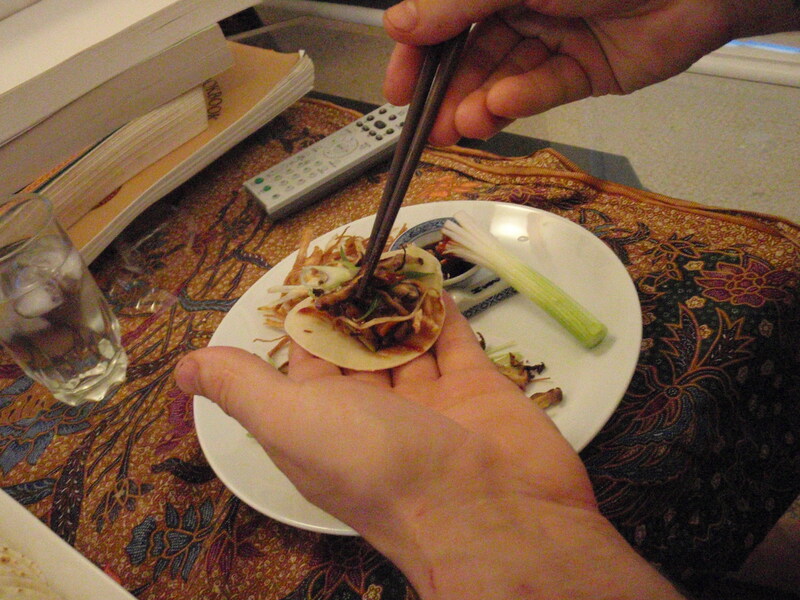 It’s not from any cookbook that we know of, the original recipe came from an online search when I first became vegetarian and had a craving for peking duck. 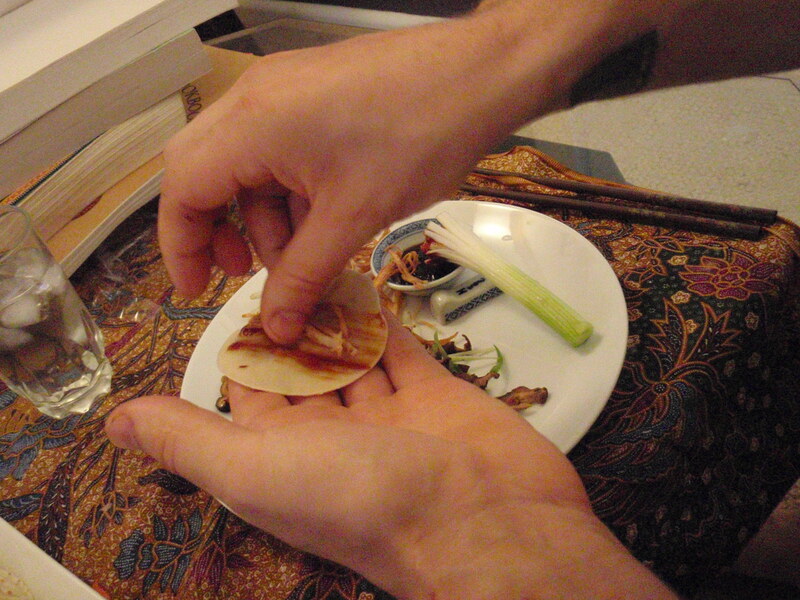 We googled ‘vegetarian peking duck’, found a recipe and over time it has morphed into the recipe below. 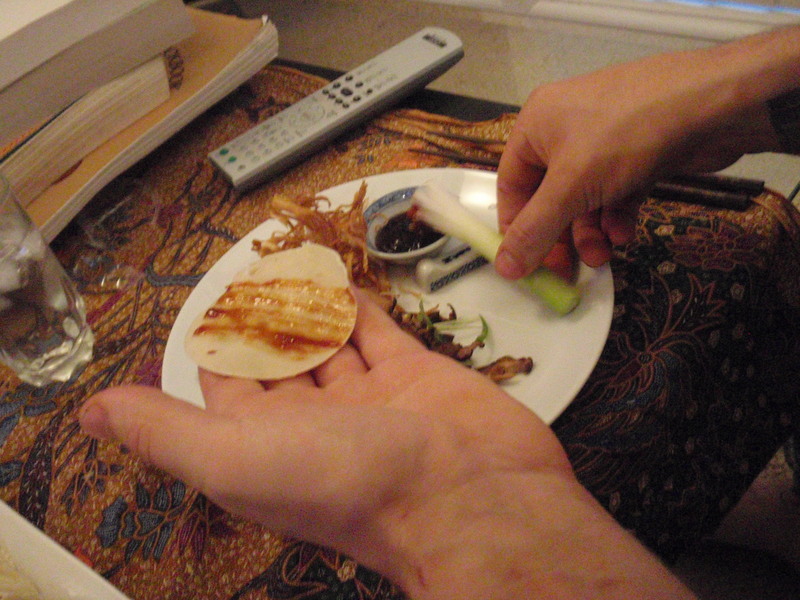 The mandarin pancakes come from the ‘Asian Food’ cookbook by Charmaine Solomon. Because this recipe has been partly made up over the years the method etc may not be as clear as some of the others.. for that I apologise! 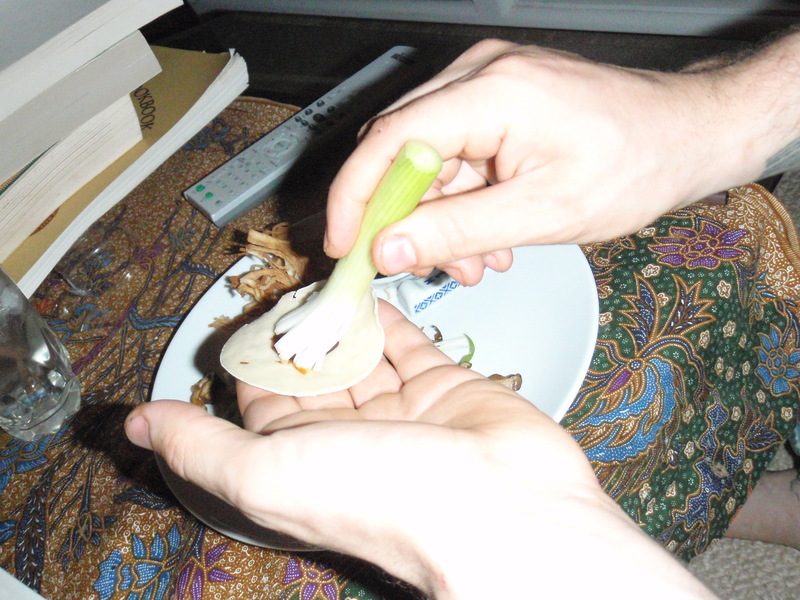 Combine flour and boiling water, mix then knead for 10 mins, wrap and stand for at least 30 minutes (during this time we make the vegan peking mushrooms). Roll dough out and using a large cookie cutter (or similar) cut into equal pieces – technically these could be as small or as large as you like. 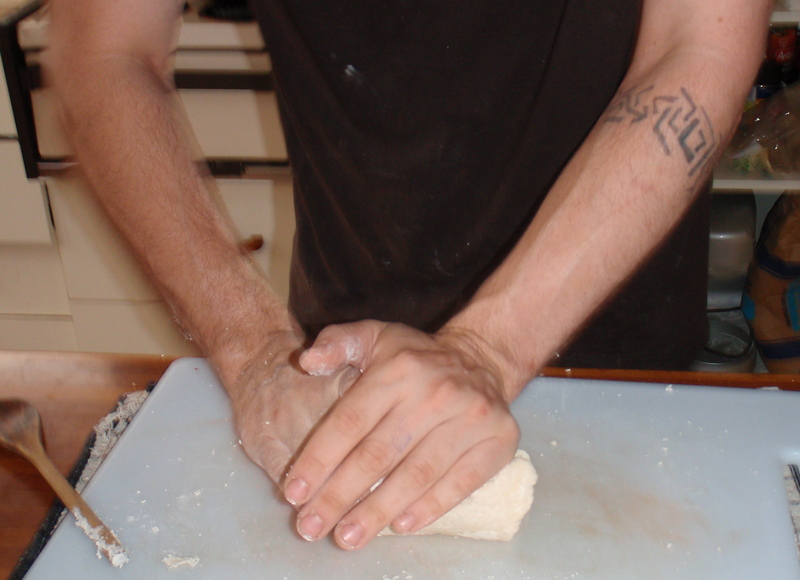 Lay one circle of dough on the bench, brush with sesame oil and place another on top. 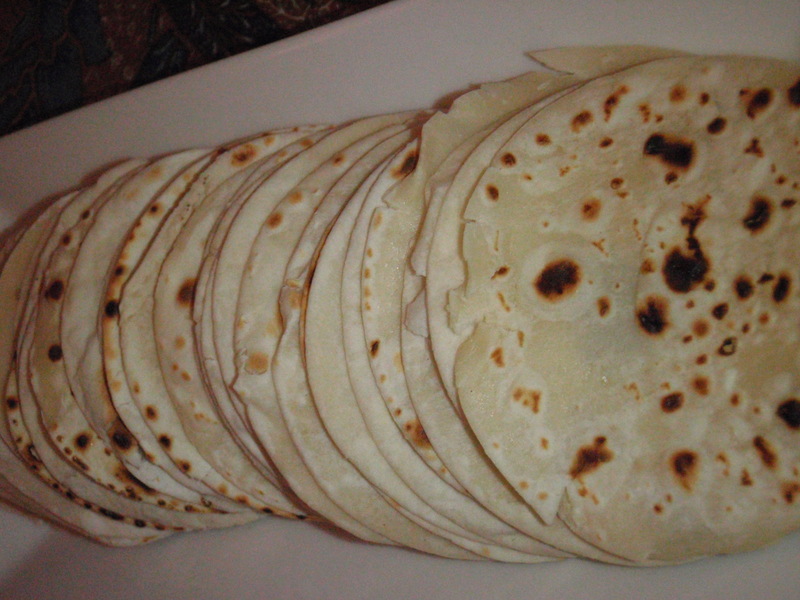 Flatten slightly with a rolling pin so that they stay together. Follow this method until all the circles are paired off. In a hot pan place the paired dough in and cook over a low head until they bubble. You should be constantly turning them. Once bubbling, remove from the pan and pull them apart. 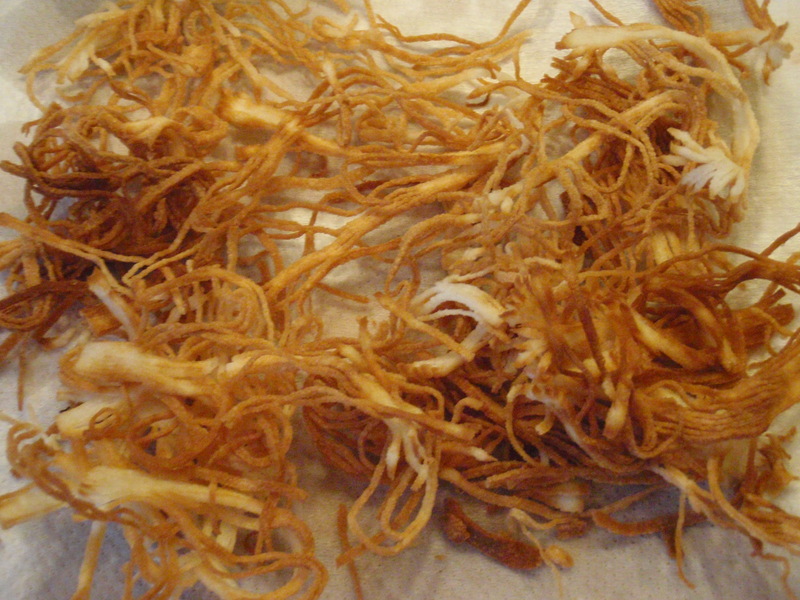 Soak dried mushrooms, drain (reserving liquid) and shred. 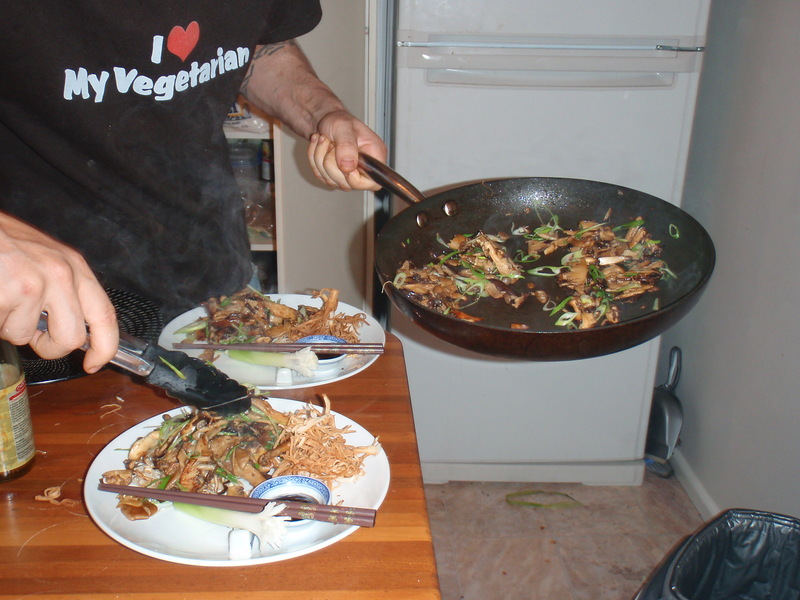 In a pan, heat oil, fry mushrooms (dried and fresh), add bamboo shoots until cooked then remove. 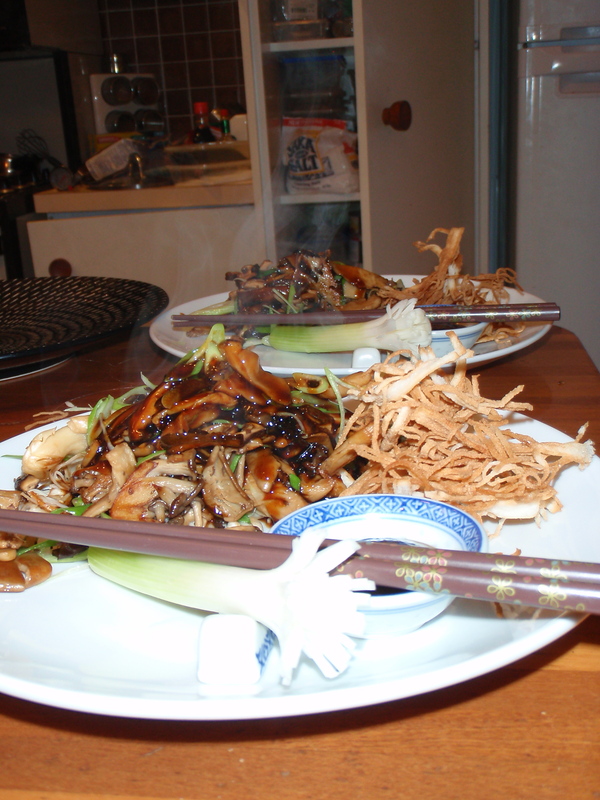 In the pan, combine soy sauce, sugar, salt and 1 tablespoon of mushroom liquid, heat and reduce slightly with corn starch. 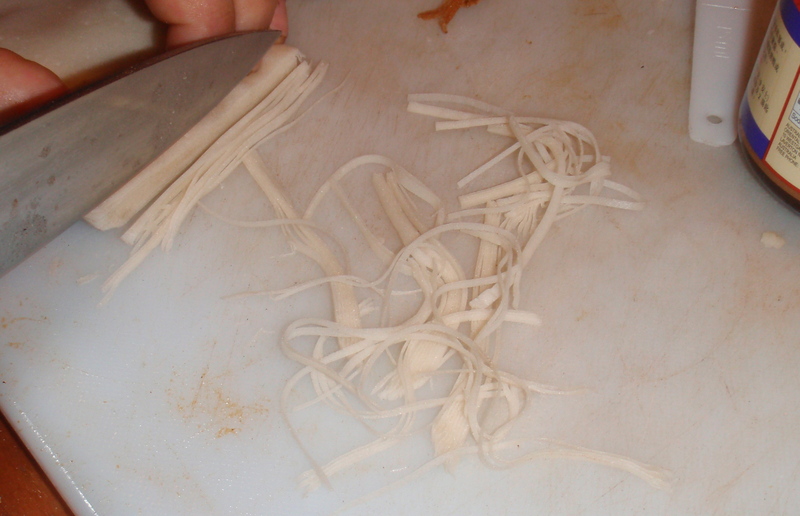 Meanwhile, cut beancurd sheets into sections (they can be small or large, we either shred finely – as in the pictures tonight – or cut into rectangles 2cm x 4cm) and deep fry until crisp. You could also use vermicelli, and deep fry that instead. 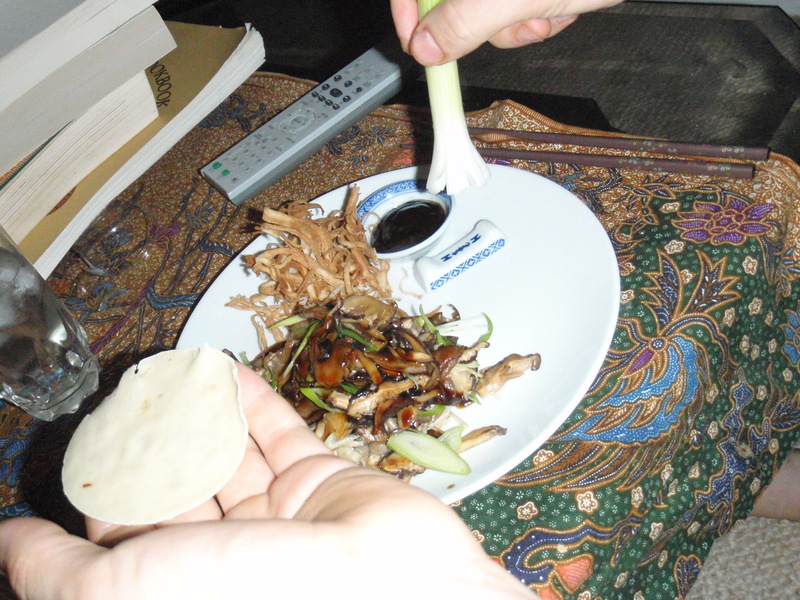 Pour soy sauce mixture over mushrooms and serve with deep fried bean curd sheets, hoisin sauce and spring onions. And now the fun part – eating it!! TaDa!! 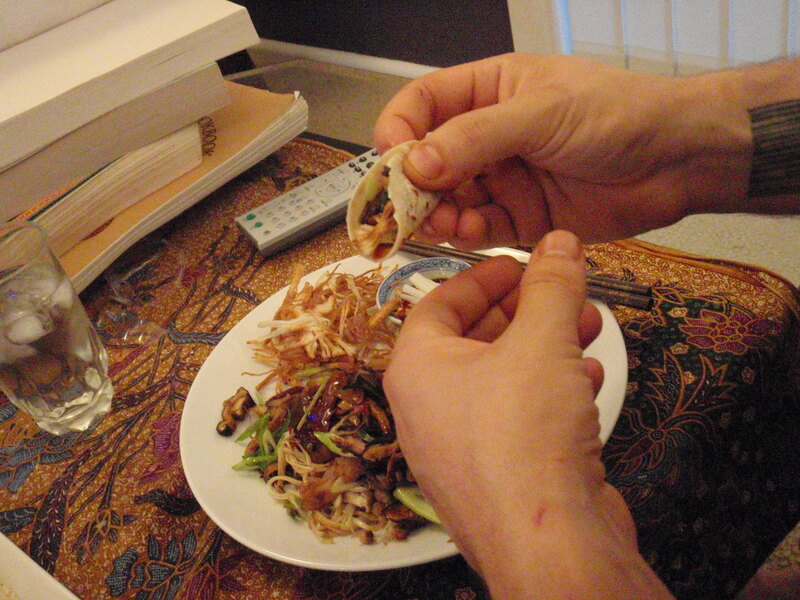 now fold in half and eat! Delish!